Along the Narmada explores the many facets of this major west-flowing river that rises high up in Amarkantak, and meandering through the central Indian state of Madhya Pradesh, merges with the Arabian Sea off the coast of Gujrat. Along the way it thunders down the Dhuandhar Falls, near Jabalpur before it smoothly glides through the towering Marble Rocks, flows calmly past Hoshangabad, and washes the ghats of the two temple towns of Omkareshwar and Maheswar. Affectionately called 'Ma', the Narmada Pulsates with the life of the people living on its banks. In fact, it is the only river that has the tradition of a parikrama, or ritual circumambulation, along its entire length of 1,312 kms – the most arduous, believed to be the most meritorious, of all Hindu pilgrimages. In Hindu mythology, Narmada, or the delightful one, is born of the sweat of Shiva. The mere sight of its waters is enough to grant Moksha to the believer. 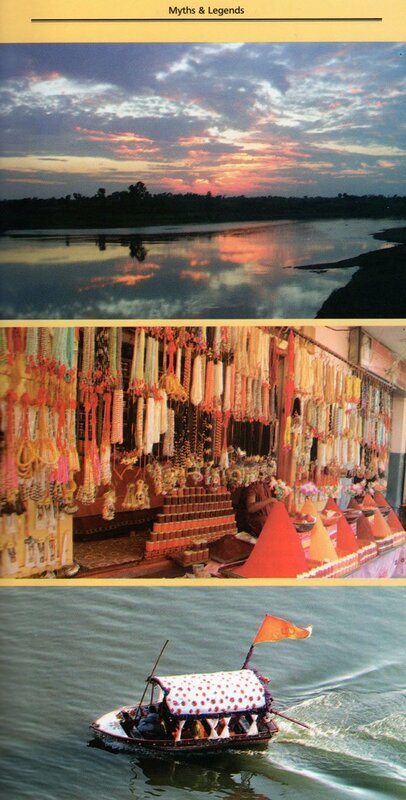 This Travel Guide takes the reader through the major towns along the river, many of them well – known tourist destinations. It is also introduces the vast Narmada Valley –home to some of the oldest archaeological finds and with a rich and varied biodiversity, India's earliest dinosaur fossil, Rajasurus Narmadadensis, was also found here. With over a hundred stunning photographs, this is a perfect companion, not just for the intrepid tourist but also the armchair traveller, to feel and experience the heartbeat of the Narmada. The Narmeda is not just a river; it is the life that is wrapped around it. 'You feel it the first time you scramble down the steps towards the ghat, edge towards the river and then slip your feet in a shot of deep cleanness , a cool that is rousing as it is calming' ('Sacred Shores of Narmada', Outlook Traveller). The river draws you to itself, it tempts you to draws you to itself you shed all your inhibitions and soak in its blueness. Ma Rewa tharo paani nirmal khal khal behto jaye re Amarhant se nikli O Rewa Jan-jan rayo thari sewa Sewa se sab pawe mewa aso Ved- Puran Bataye re. This song by the Indian rock band, Indian Ocean talks about the sacred waters of Narmada, affectionately called Ma. Originating at Amarkantak, this grand river has been revered by people for ages. The ancient Vedas and Puranas say that those who worship Narmada with a pure heart are freed from all worldly troubles. 'For people who live along these banks, the Narmada is the other magnet of Hinduism, a counterpoint to the Ganga' (Haritosh Singh Bal, Water Close Over Us). Fed by rain, it flow through terrain familiar to the great Sanskrit poet, Kalidasa, who wrote of 'Rewa's streams spread disheveled at Vindhya's rocky foothills, like ashen streets on an elephant's falnk' (Ram Gopal, Kalidasa:His Art and Culture). Of its fourteen other names, Rewa, the leaping one, is the best known, but for most of its courses, the river is just Narmada, the delightful one. The main west-flowing river of the subcontinent, Narmada rise at Amarkantak, over 1,057m above sea level, and meanders through beautiful broad –leaved forests and fertile plains before merging with the Arabian Sea off the coast of Gujrat. Barely a mountain stream (1.8 m wide) after its inception at Narmada Udgain in Amarkantak, it eventually discharge a volume of water equivalent to the combined flow of the Ravi, Beas and Sutlej into the sea. The river flows through a narrow gorge between the Vindhya and Satpura mountain ranges, serving as the geographical barrier between the northern plains and peninsular India, passing as it does right through the heart of India. Geogiclally, the Central Indian Plateu is part of the Gondwana Plate and through it running from west to east, are the rift valleys of the Tapti and Narmada. 'The Narmada is, of course, much older than the Ganga, formed when the latter was barely a twinkle in Lord Shiva's eye, from the meeting of Gondwana land with the Central Asian landness. The Convergence thrust up a rift valley in which the Narmada flows over some of the oldest rocks on earth. She is flanked on the north bank by the sandstone Vindhya and on the southern by the basalt Satpuras, making the river the geological barrier between the northern plains and the peninsular.